Every good real estate investment comes to an end at some point. When it is time to sell the property, it is important to realize that Rohan Realty Associates is there to help guide you through the process to the most effective [and profitable] result possible. Our Exclusive Listing Service begins with an in-depth review and understanding of what makes your property attractive to potential buyers. We dive deep to identify the local market characteristics, occupancy rates and rental rates in the area. 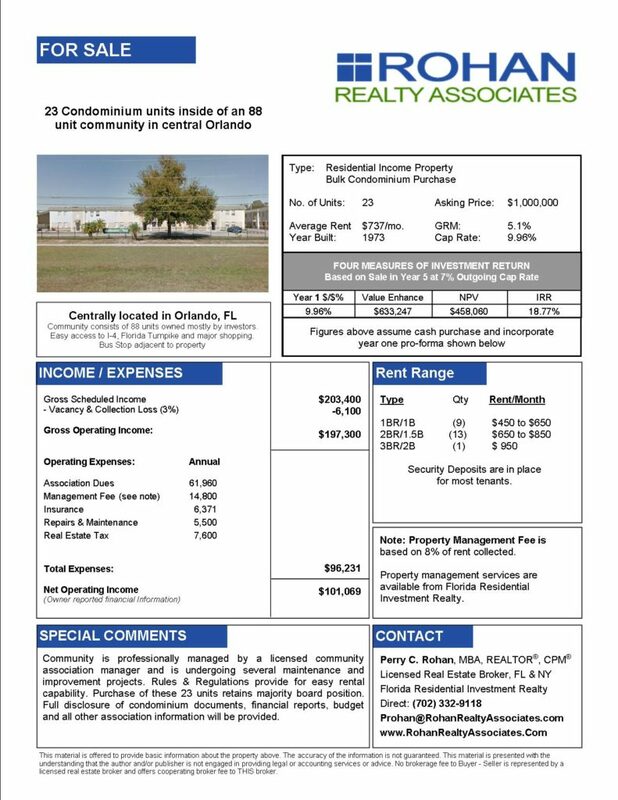 We closely examine the financial results and utilize industry-leading analysis tools to report “key” financial ratios (i.e., Cash-on-Cash Return, Net Present Value, Internal Rate of Return, Value Enhancement, CAP Rate, Debt to Equity Ratios and more) and we take pictures of the entire property. We prepare an “Offering Memorandum” that outlines all pertinent details concerning the property for sale. Specific sections include a disclaimer, table of contents, executive summary, property photos, renderings, real estate maps, market overviews, tenant information, rent rolls, cash flow analysis & projections as well as other property specific details that are dependent upon investment and property type. We then professionally market your property to potential buyers throughout the United States. We are members of various residential and commercial real estate marketing platforms and work with real estate professionals in a cooperative capacity.